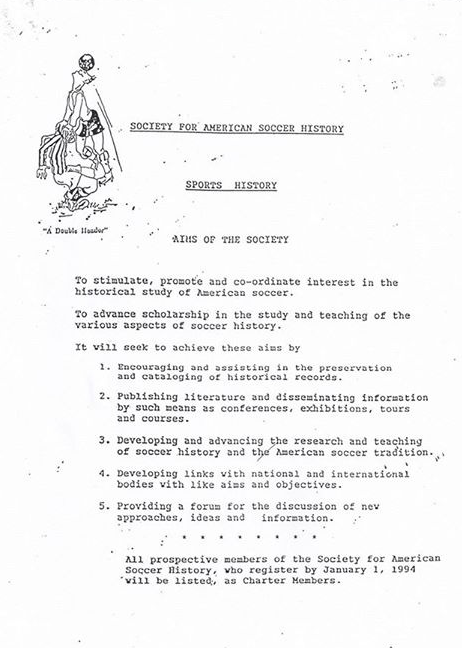 The Society for American Soccer History was founded in 1993 by American soccer historian Sam T.N. Foulds. To stimulate, promote, and coordinate interest in the historical study of soccer in the United States. To advance scholarship in the study and teaching of various aspects of soccer history. Developing and advancing the research and teaching of the history of soccer in the United States. Publishing literature and disseminating information by such means as conferences, exhibitions, tours, and courses. Providing a forum for the discussion of new approaches, ideas, and information. Encouraging and assisting in the preservation and cataloging of historical records. Developing links with national and international bodies with like aims and objectives. The founding SASH mission statement from 1993, written by Sam T.N. Foulds.